Background processing is how AutoCAD allows you to get back to work when you send off a plot. Without this setting, you may tie up your machine while it cranks away at your processing. Turn both of these on. Plotting – setting this one to on by checking the box will enable background processing for the PLOT command. Publishing – setting this one to on by checking the box will enable background processing for the PUBLISH command. When background plotting is enabled, an icon will display in the lower right corner of AutoCAD. There are options that are enabled when you right click on the icon. 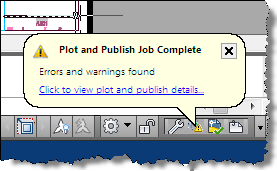 Right-click any of the plot and publish icons in the tray on the right side of the status bar. The icon changes depending on what is happening in the background. A plotting details report is available. No errors and warnings occurred. A plotting details report is available. Errors and warnings occurred. When your process is running you might see a dialog box like below.